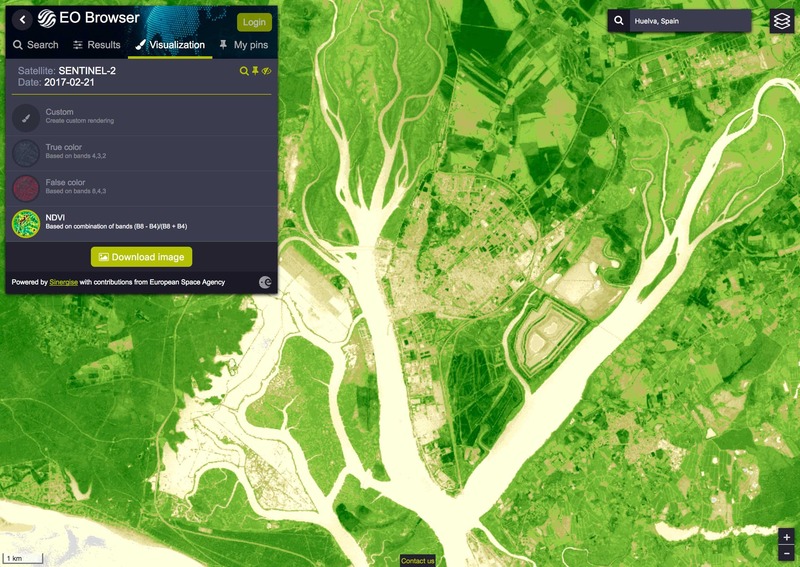 Sinergise is launching a free satellite imagery visualisation tool – EO Browser – bringing a possibility to easily search and study vast amount of archive and fresh satellite imagery residing in the cloud - Sentinel-2 and Sentinel-3, ESA’s archive of Landsat 5, 7 and 8, global coverage of Landsat 8, and Proba-V products. All of these are available in one place for the first time, providing a full resolution insight into more than 30 years of changes in Europe and several years worldwide. Everyone can find a relevant scene everywhere on the Earth and dive in the details in a matter of seconds. EO Browser is an easy to use web application, publicly available with no registration needed to access standard functions. It combines many remarkable features such as comparison of data to easily identify changes, various visualisation options (true color, false color, NDVI, etc. ), custom band combinations and even some data processing mechanisms (Figure 1), allowing users to run classification scripts. It is a perfect tool to find relevant satellite images and prototype various pixel-based algorithms. It provides a possibility to pin the layers and locations, making it easy to resume research at a later stage. Leeway to export data processing results in georeferenced files and store algorithms is offered to registered users. Figure 1: Prototyping pixel-based algorithm on EO Browser: a decision tree from A. Hollstein et al. 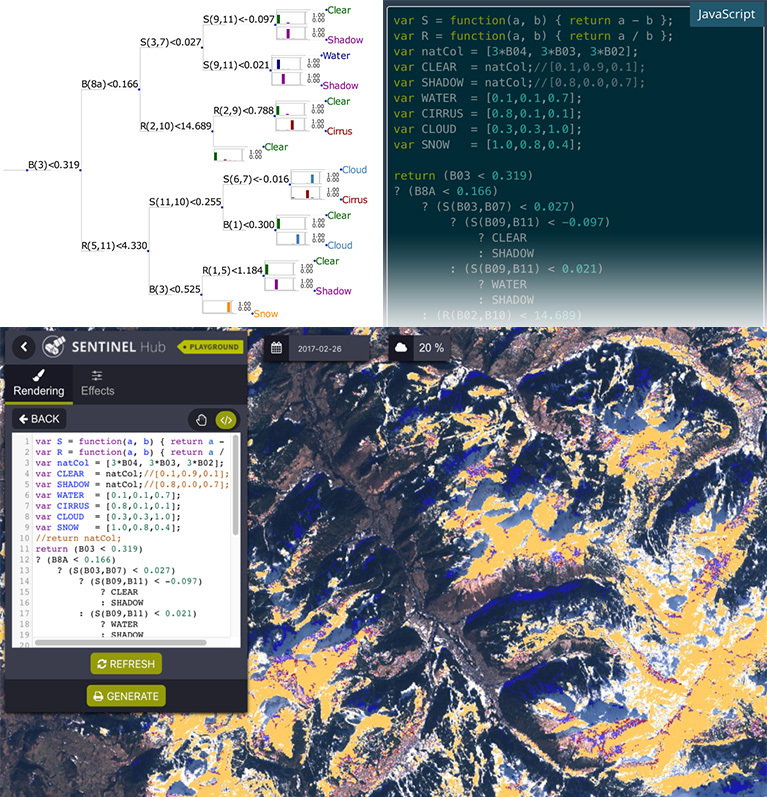 (top left) is coded into a custom script (top right), and immediately visualized in the EO Browser (bottom). 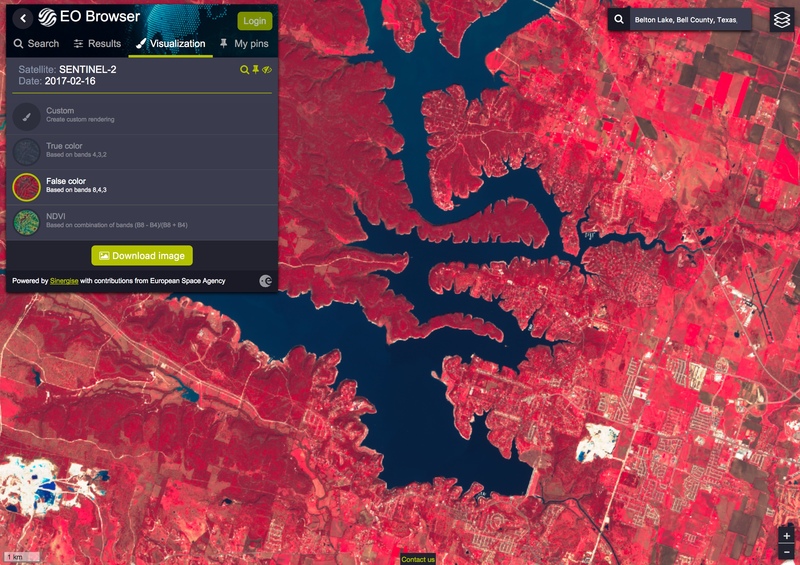 Instant access to browse through petabytes of newest and archive data and chronological comparison of full resolution images from the data sources mentioned above raises Earth observation to a completely new level. One simply goes to the area of interest, define search criteria such as time range and cloud coverage, and inspects the resulting data from different sources. 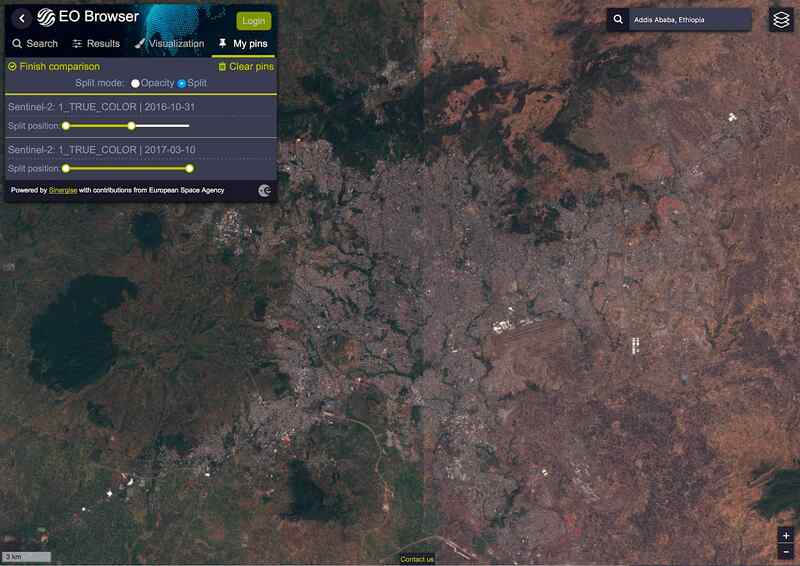 Figure 2: Addis Ababa, Ethiopia - A comparison of full resolution images acquired on 2016-10-31 and 2017-03-10. Behind the scenes our technology is exploiting cloud infrastructure and smart access to the data to produce results in a matter of seconds for a chain of actions that would typically take several hours. Expert users, who would like to get earth observation data in their own GIS environment, can make use of Sentinel Hub OGC services. With EO Browser, which offers all ESA optical missions in one place, there is no need to download, archive and process petabytes of data as desired result can be shown immediately in the browser or within your own GIS environment. Recently integrated Sentinel-3 mission made it possible to combine Sentinel-2 with a bit less detailed but higher frequency data - at European latitudes it is possible to get a new image almost every day. “A revolution is happening in Earth Observation. With enormous amount of data being available, large part of it free, there are unlimited possibilities out there to address various user cases. EO Browser, built on the top of Sentinel Hub, represents a part of this process, but there is a lot more to be done.” said Grega Milcinski, managing director at Sinergise. A front-end application is an open source so anyone can take it and build added value services on top of Sentinel Hub OGC services. Data Scientists, Software Developers and GIS Engineers at Sinergise developed EO Browser in close cooperation with ESA. It will be launched at the World Cover conference at ESA, ESRIN in Frascati, Italy on March 16, 2017. You are warmly welcome to visit us there and learn more about the possibilities EO Browser is offering. Try EO Browser yourself or contact the team for more details!